One of the interesting things of the undeveloped and developing world is cell phone charging stations. People are so poor they cannot afford electricity, yet almost everyone can afford a $10 cell phone if for no other reason than the business of theirs it helps facilitate. As we walked around the business district in Ruhengeri, Rwanda we saw a number of cell phone charging stations. We were in a developed part of the country, so no solar panels, you can just see the electric cord on the lower left in the picture. MTN is like an AT&T or Verizon service provider. What does this say about the wealth or the economy, both of the world and in Rwanda, or much of Africa? For one it highlights the importance of connections between people. People don't have lights in their house, but they have a cell phone to connect with people. A light bulb, the most basic of electric appliances, is still a luxury for many. Forget computers, refrigerators, ovens, flat screens, and DVD players, these people don't even have a single outlet in their house to charge a phone. 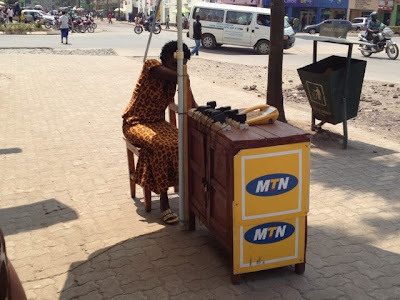 Not only do people pay to charge their phones at this stand, it is worth it for this lady to sit here and guard them. Her job is recharging and guarding up to 20 cell phones at a time. I guarantee she does not make $7.25 an hour, the minimum wage in the United States. At an electricity cost of about $0.15 per kilowatt hour (1000 watt hours) wholesale and cell phone battery size of 4-5 watts this is a business of cents not dollars.